The rich mythology of the Northwest Pacific coast cultures identifies a number of characters that seem likely to have god-like potential. 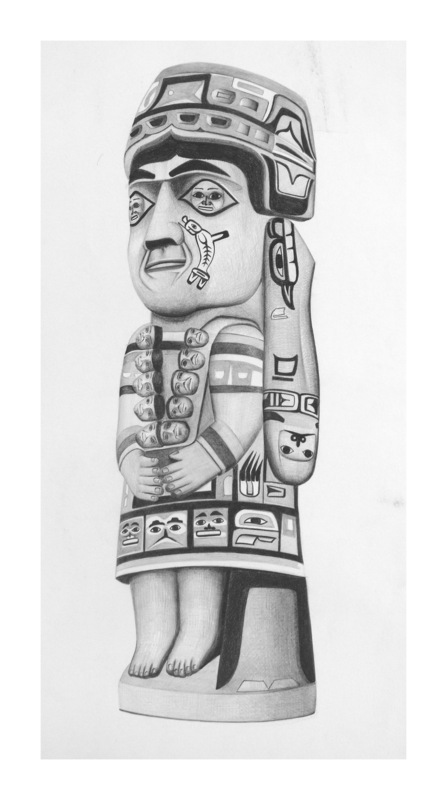 One of these, among the Haida, is Master Carpenter who taught the people how to carve and paint the meaningful imagery that appears on the clan houses. The story goes that before the people knew very much about art Master Carpenter appeared in a halo of light. He told the Haida to go inside their houses and no matter what they might hear during the night, not to rise from their beds. Even though much pounding and scraping and other noises were heard the people did as they were told. In the morning they found their houses decorated with magnificent carved corner poles and the walls painted with beautiful clan totem designs. Then Master Carpenter told the people he would return each day to teach them the arts of carving and painting. So, I’m wondering if the Haida people saw Master Carpenter as God. You’ve got the halo and the unreal amount of art produced in a very short time which is pretty potent if not omnipotent. It seems to pretty clearly place him into the realm of the supernatural at least. I would think that, for the carvers and painters, he should carry a lot of weight-someone to appeal to for inspiration, thank for well-received work and blame for poor performance. I’m just not sure, after he did his initial teaching, how much he continues to hang around. There’s no doubt he could be useful but I’m not sure he belongs on the short list.